Mailers for Amy Biviano go out next week and should land in mailboxes right before the primary ballots. Republican Spokane County Sheriff Ozzie Knezovich has given a boost to the campaign of a Democrat running for state Legislature in Spokane Valley, a move that highlights division in the Republican Party about incumbent state Rep. Matt Shea. Knezovich gave permission to Amy Biviano, who is challenging Shea’s re-election bid, to use a quote praising her position on domestic violence issues on her campaign material. He also agreed to be photographed shaking her hand in front of the Spokane County Courthouse. The picture will be showcased in a Biviano mailer that will arrive in Spokane Valley mailboxes next week. 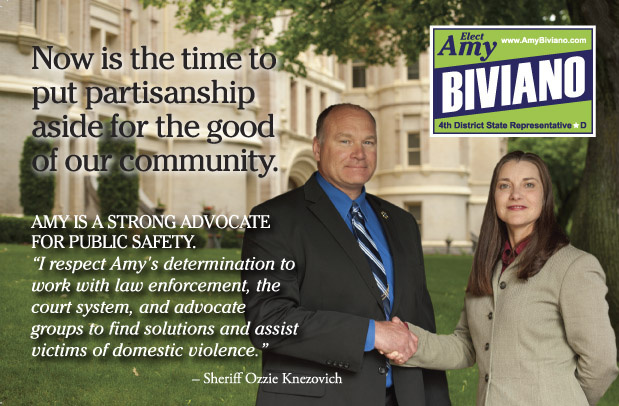 “I respect Amy’s determination to work with law enforcement, the court system, and advocate groups to find solutions and assist victims of domestic violence,” says a Knezovich quote on Biviano’s mailer. Despite his willingness to be highlighted on her campaign material, Knezovich said Thursday that he’s officially neutral in the race and declined to say how he would vote if he lived in the 4th Legislative District. Biviano said she had about 12,000 of the mailers printed. Printing and postage will cost about $10,000. Attempts made to reach Shea were unsuccessful this week, but Spokane County Republican Party Chairman Matthew Pederson said he’s concerned about Knezovich’s assistance to Biviano. Republicans should remain united to help return control of the state House to the GOP, he said. “Although Amy Biviano is a quality candidate, she doesn’t fit the profile of a 4th District candidate,” Pederson said. A Democrat hasn’t held a seat representing the Spokane Valley district since 1994. Biviano is the former chairwoman of the county Democratic Party and is a certified public accountant. She acknowledges that her positions differ from Knezovich on certain issues, including gay marriage, but she says she will focus on the economy and education. “This is the time to put aside the partisanship and just have an effective local advocate for our community, and Matt (Shea) has shown through his record that he has not had the ability to compromise and be effective,” Biviano said. Shea has been a controversial figure in Republican Party politics and was shunned by the Republican-dominated Spokane County Commission in 2011 when it had to fill a state Senate seat that opened following the resignation of Sen. Bob McCaslin for health reasons. Shea was the first choice of the county Republican Party, but the commission instead backed businessman Jeff Baxter. “I wish to state that under no circumstances would I support Matthew Shea for any public office,” McCaslin wrote in a letter to Spokane County commissioners when they were considering his replacement. McCaslin died last year. McCaslin’s position on Shea is highlighted on Biviano’s campaign mailer. Janie McCaslin, the late senator’s daughter, said Biviano met with her and her brother recently to seek their opinion about using their father’s quote. She said she and her brother are fine with Biviano using it. Mielke, who is running for re-election, said this week that he isn’t planning to make endorsements in the race between Shea and Biviano.